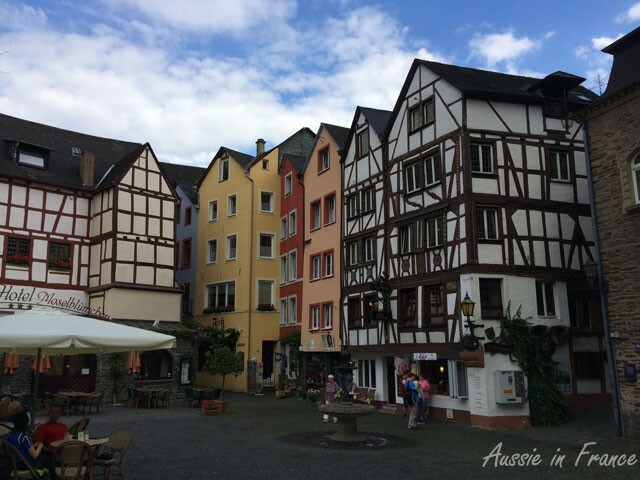 We arrive in Bernkastel at about 1.30 pm after a 4-hour drive from Hann Münden with only a couple of rough patches on the motorway. I wouldn’t have liked to be going in the other direction around Hanover though. The line-up seemed to go on forever. One thing I will not regret are the German motorways. The sun is out although the temperature is not that high. We have a light lunch at the Weinkulturel centre which is next to the 15th century Saint Nicolas hospital where they only ever have 33 patients because it was the age at which Christ died. In any case, it’s a very lovely spot. We have to check in at our ferienwohnung (holiday flat) between 2 and 3 pm. The owner is very friendly and speaks good English. 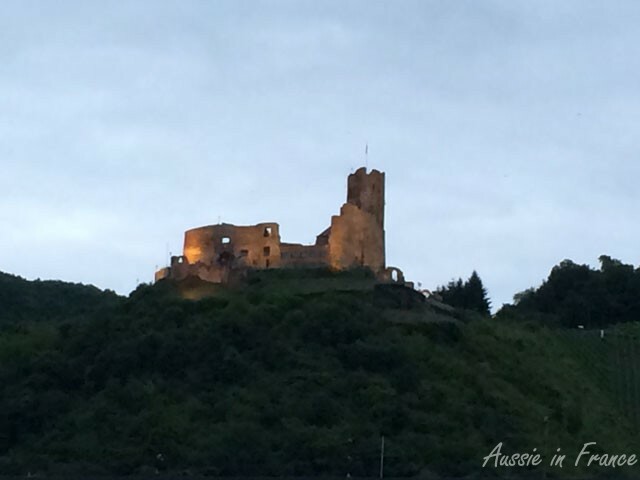 The flat is fairly rudimentary but has a little balcony with an excellent view of the vine-covered hillside and the ruins of the Burg Landshut castle on the other side of the Moselle if you ignore the school in the foreground. The big problem is the internet connection which only works if I sit on the step between the entrance and the living room. I try moving the small sofa but one of the legs falls off … not our best accommodation. After a short shopping excursion, we set out on our bikes directly from the flat 15-K downstream to Lösnich. 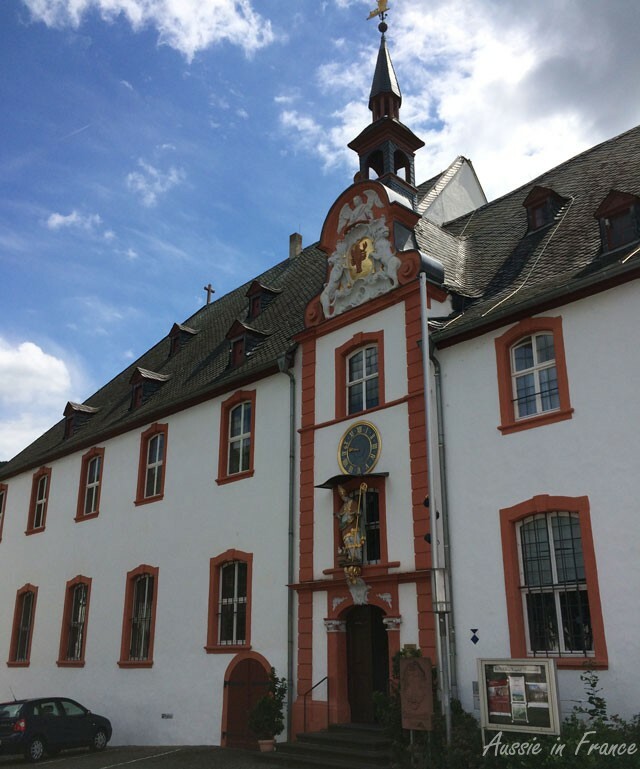 On the way , we discover a small platz in Bernkastel which we find attractive and get some brochures from the tourist office next door. We’re a little disappointed with the countryside which corresponds to what we initially saw around Kondorf. Jean Michel is a little worried that it’s not going to bet any better. Also, we are often parallel to the road. We see some interesting sundials, though, in the middle of the vineyards. They were built in the 19th century so that the workers knew when to knock off for lunch or go home for the day! 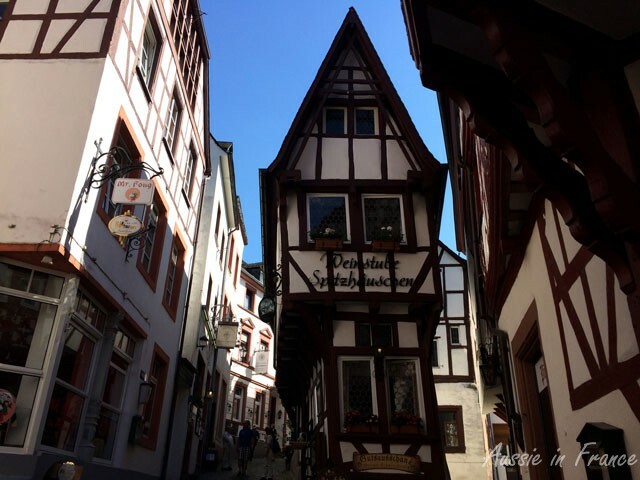 On our return to Bernkastel, we can’t find a restaurant to our liking so end up going home, which is actually much more relaxing and we’re really not that hungry. We watch the sun set over Burg Landshut on our little balcony. The bed turns out to be a disaster – hard and creaky. The pillow gives me a sore neck so I don’t have a very good night despite the good shutters. I’m really starting to long for my own bed. Today, we’re heading 25 km upstream to Neumagen-Dhron. 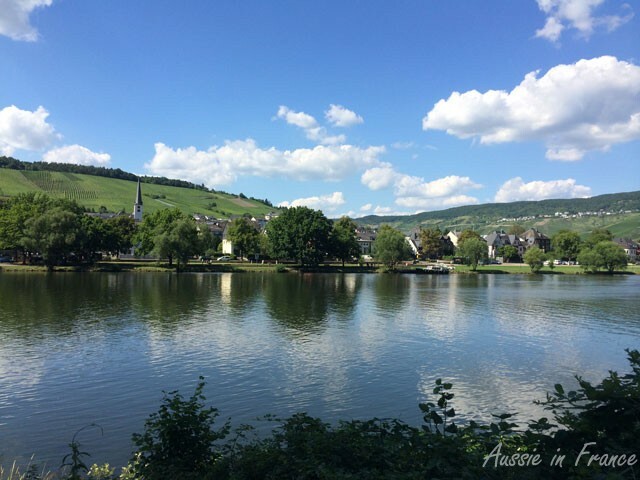 The scenery is much prettier and the bike path is closer to the river and we go through a lot of little villages. 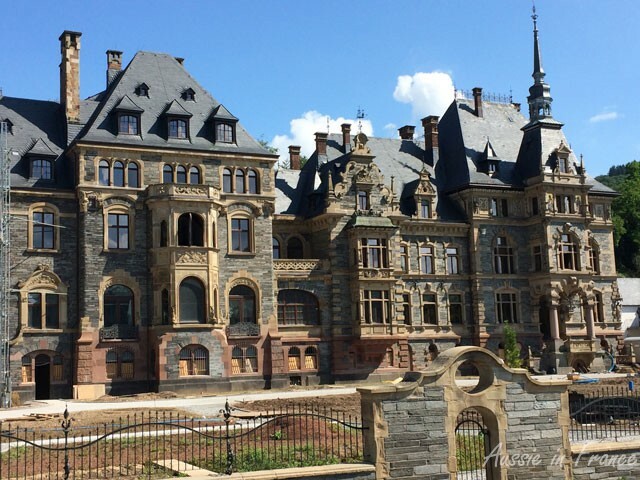 In Lieser, we see a very unusual 19th century Neo-gothic building that is obviously being refurbished. It has some amazing details on the façade including mosaics and fish-shaped gutters. 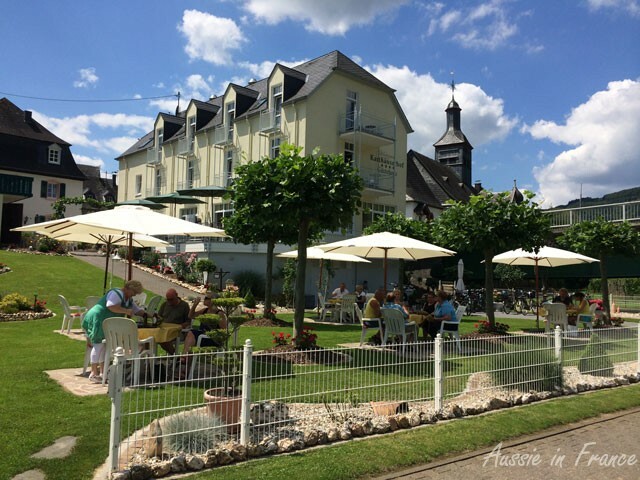 We come across any number of weinguts or wineries but no cafés, not even for radlers (cyclists). We finally get some coffee at Peter’s bäckerei in where I have to bring out the coffee myself. Our bike path includes some nearly vertical sections which I’m flat out wheeling my bike up but Jean Michel, who’s been riding a bike since primary school, cycles up with great aplomb. 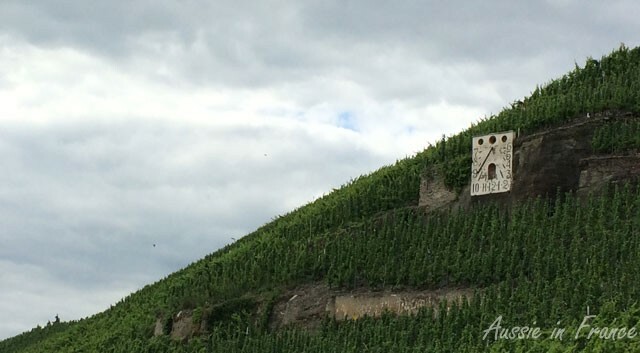 Most of the vineyards which encircle us on every side are also nearly vertical! 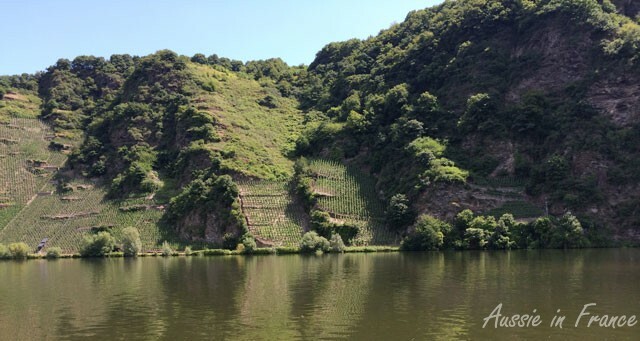 In one place, there is obviously no other way to get to one lot of vines except by boat. 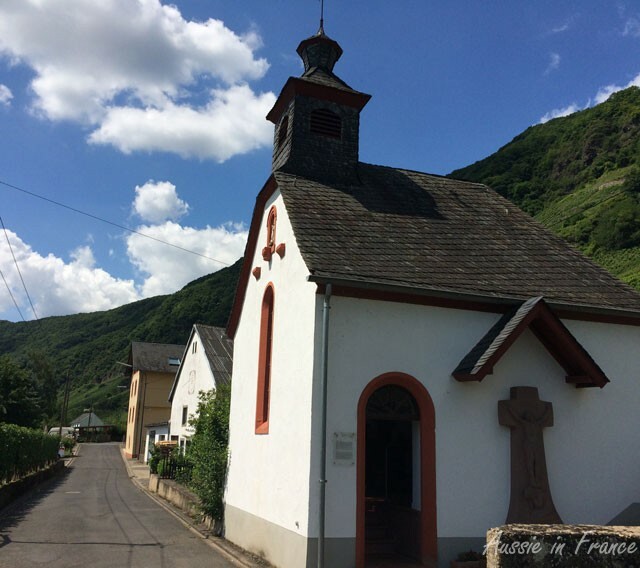 I spy a little roadside chapel whose legend is explained in English for once. Probably in the 17th century, a wooden cross swirled around in the same place when the river was in spate, pointing in the direction of the village of Ferres. This was taken as a sign to build a chapel. Today, the locals call it Ferres Cathedral because of its great importance to them. 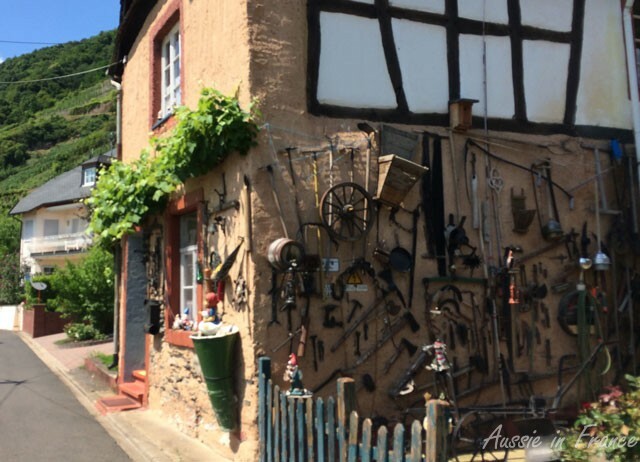 Further down the road, there is a house that looks like it has a second-hand shop on its wall! 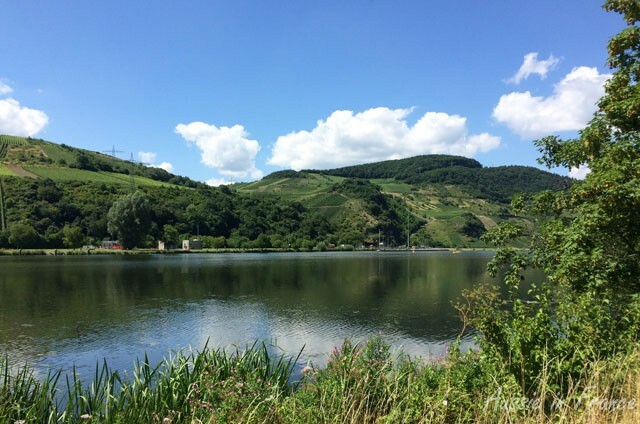 As we cycle past Piesport, I see a couple of likely lunch spots just in case Neumagen-Dhron doesn’t have anything better to offer. I’m right and by the time we get back to Piesport along the other side of the river, we are well and truly ready for our trocken weiss wein! It must be about 28°C. We choose the Karthäuserhof with its inviting parasols, and only the bike path between us and the river. We manage to communicate with the very jovial waitress and enjoy our wiener art schnitzels and pommes frites. 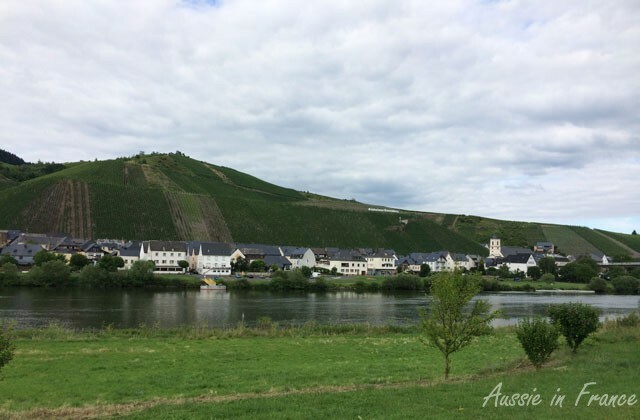 It’s a bit difficult to get back on our bikes after such high calorie food (not to mention the wine) and we seem to go up and down a lot among the vineyards but we finally reach Bernkastel ready for an ice-cream. I suggest we go further than the platz we’ve already visited and to our immense surprise, the little streets are very pretty (and full of tourists). Then we come out into Marktplatz and look at each other in bemusement. Why isn’t this mentioned in our guidebooks and the local brochures? 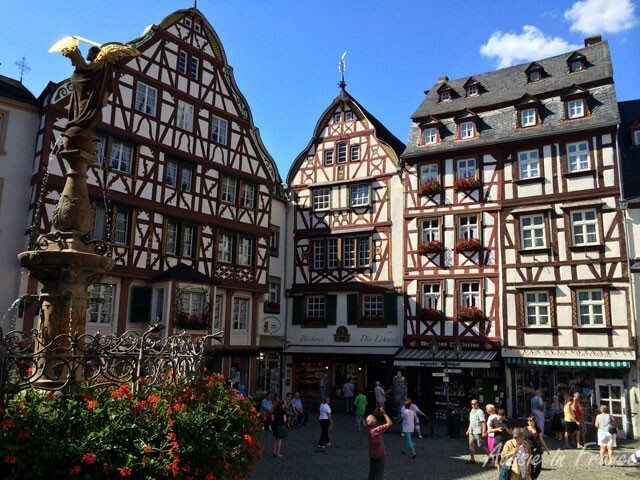 The 16th and 17th century façades are really beautiful. 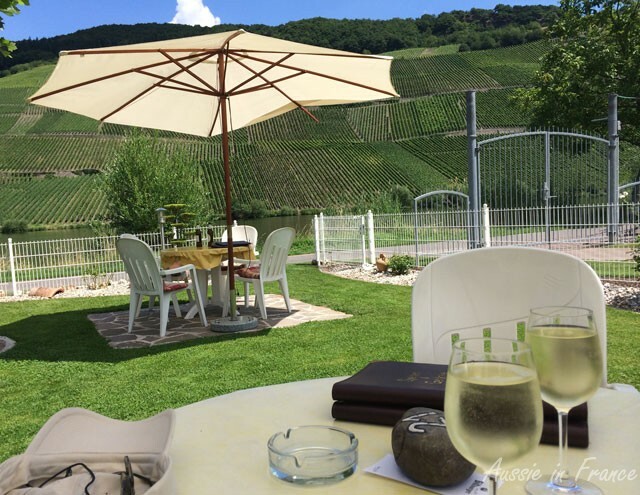 After wandering around we finally end up at a shady table at the Ratskeller with a glass of wine and our binoculars studying all the wonderful architectural features. I see that the façades are not just painted but carved as well. They also have some lovely wind vanes. 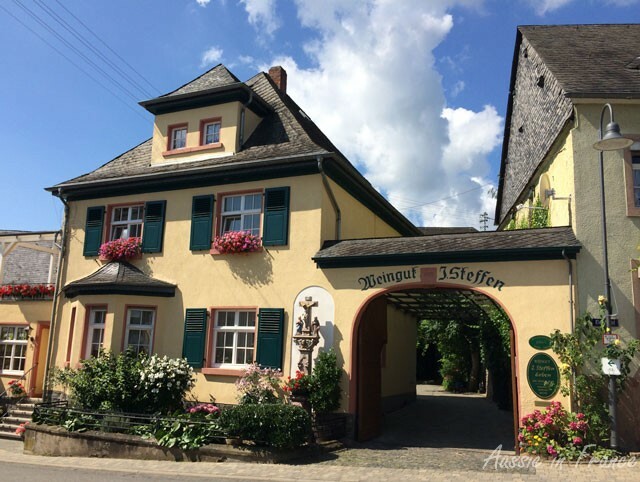 Before we go and visit the only remaining town gate, we enter the nearby weingut, Robert Schmitz-Herges, which looks as though it might keel over any moment, and buy an excellent 2010 Spitzhäusen riesling classic at 4.90 euro a bottle! 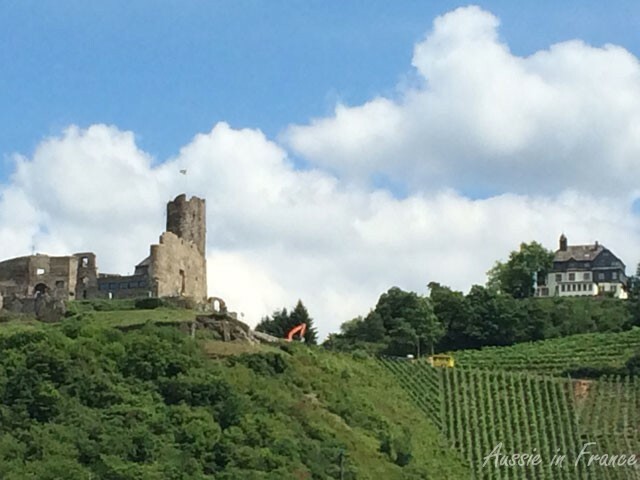 All the vineyards are around Bernkastel. 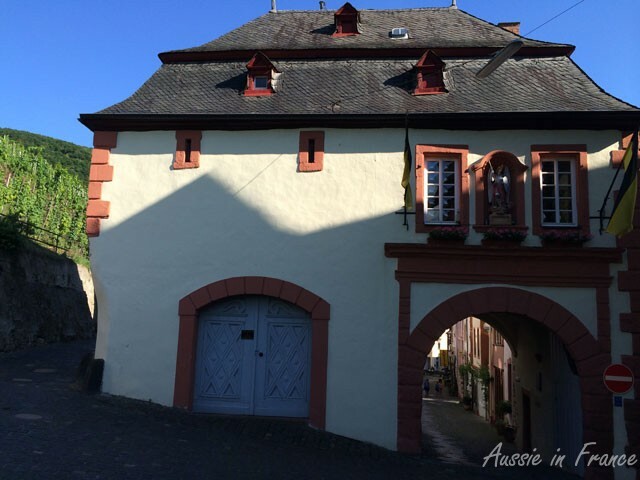 This entry was posted in Accommodation, Architecture, Cycling, Food, Germany, Restaurants and tagged Bernkastel, cycling in germany, piesport. Bookmark the permalink. The castle ruins really appeal to me. We loved watching them light up. Your cycling trips are encouraging me to consider doing one myself. Been a long time since I’ve ridden a bike, but living in Tasmania there are many beautiful places to trial it. 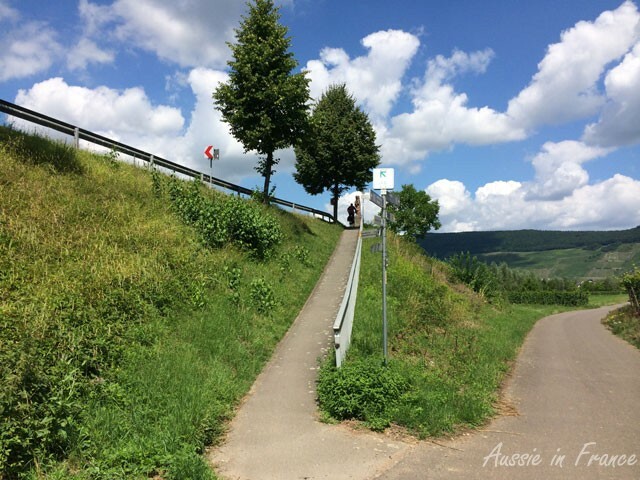 Next problem would be where to go on a bike tour – so many gorgeous places in Europe to consider. I envy your life in France. You’ll definitely have to take it up again. It’s such fun. And I would recommend the Danube, particularly the Wachau in Austria http://www.aussieinfrance.com/2013/07/cycling-along-the-danube-wachau-in-austria-a-world-heritage-site/ and the S-bend, also in Austria http://www.aussieinfrance.com/2013/07/cycling-along-the-danube-linz-to-passau-the-s-bend/. They are out of this world! I’m loving seeing all your photos! The building in Lieser is too cool. What a fantastic trip – jealous! Glad you’re enjoying the photos. I wonder if one day the building in Lieser might become a hotel. Maybe you could stay there!